Produces Enchanted Water every 2 min. Produces Magic Feed every 2 min. Produces Enchanted Eggs every 3 min. Produces Magic Spells every 3 min. Produces Riding Halter every 4 min. Produces Heart Medallion every 5 min. Produces Adoption Papers every 8 min. Small Drinking Bowl = Enchanted Water x2 | Crafting Time: 2 min. Large Drinking Bowl = Enchanted Water x2, Small Drinking Bowl x1 | Crafting Time: 2 min. Magical Fountain Base = Enchanted Water x2, Magic Spells x1 | Crafting Time: 2 min. Emerald City Lollipop = Magic Feed x3, Winkie Grain x1 | Crafting Time: 5 min. Winkie Grain = Magic Feed x2 | Crafting Time: 5 min. Munchkin Candies = Magic Feed x2, Enchanted Water x2 | Crafting Time: 5 min. Munchkin Treats = Magic Feed x2, Munchkin Candies x1, Emerald City Lollipop x1 | Crafting Time: 5 min. Nesting Hay = Enchanted Eggs x3 | Crafting Time: 10 min. 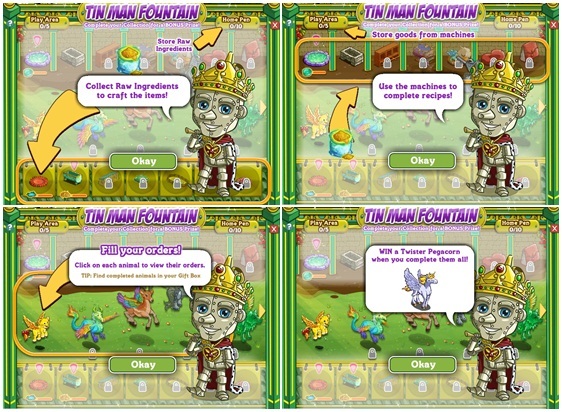 Magic Spells x2, Munchkin Treats x1, Magical Fountain Base x1, Enchanted Egg x1, Decorative Paint x1, Nesting Boxes x1. Winkie Grain x1, Large Drinking Bowl x1, Munchkin Treats x1, Magic Feed x1, Candling Candle x1, Decorative Paint x1, Warming Lamp x1, Nesting Boxes x1, Stone Spell x1. Enchanted Water x2, Ice Spell x1, Munchkin Candies x1, Emerald Martingale x1, Warming Lamp x2, Winkie Lead Line x1. Magic Spells x1, Lightning Spell x1, Munchkin Treats x1, Heart Medallion x1, Warning Lamp x1, Stone Spell x1, Small Drinking Bowl, Fire Spell x1, Shrinking Potion x1. Nesting Boxes x1, Winkie Blanket x1, Emerald City Lollipop x1, Shrinking Potion x1, Lightning Spell x1, Emerald Martingale x1, Munchkin Candies x1, Nesting hay x1, Ice Spell x1. Magic Spells x3, Munchkin Treats x2, Stuffed Cog Pillow x1, Decorative Paint x1, Fire Spell x1, Winkie License x1, Warming Lamp x1, Nesting Boxes x1, Winkie Brush x1. Large Drinking Bowl x2, Winkie Reins x2, Winkie Saddle Blanket x1, Adoption Papers x3, Growing Potion x2, Winkie Harness x1, Munchkin Candies x2, Emerald Saddle x1, Emerald Collar x1. Nesting Hay x6, Nesting Boxes x6, Emerald Documents x2, Fire Spell x1, Winkie Lead Line x1, Lightning Spell x1, Stuffed Heart Pillow x1, Emerald Martingale x1, Emerald Night Cap x1. Enchanted Eggs x6, Large Drinking Bowl x5, Winkie Saddle Blanket x2, Munchkin Treats x2, Winkie Blanket x1, Emerald Saddle x3, Winkie Reins x1, Winkie Curry Comb x1, Emerald Collar x1. Emerald City Lollipop x4, Nesting Boxes x4, Stone Spell x3, Fire Spell x2, Shrinking Potion x3, Lightnin Spell x3, Decorative Paint x3, Candling Candle x3, Winkie named Food Dish x1.